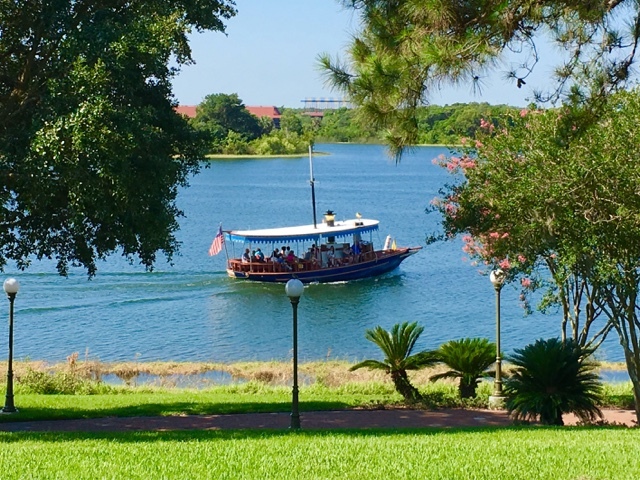 The Living with the Land boat ride in Epcot is both entertaining and educational. It also includes one of the largest hidden Mickeys. 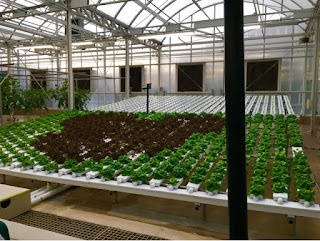 I took this shot while riding through the greenhouse tonight. 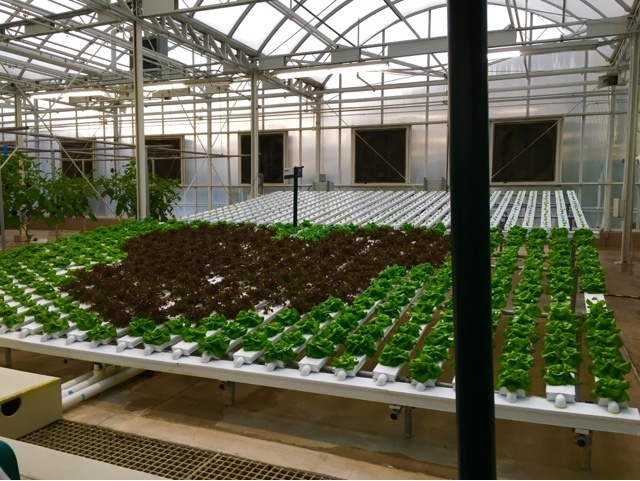 You can see the red lettuce forms a classic Mickey head. 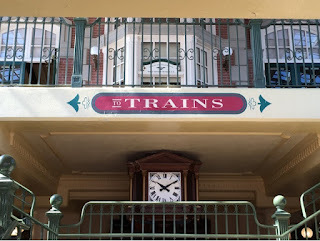 One of the most authentic looking parts of Town Square at Magic Kingdom is the Main Street Railroad Station. 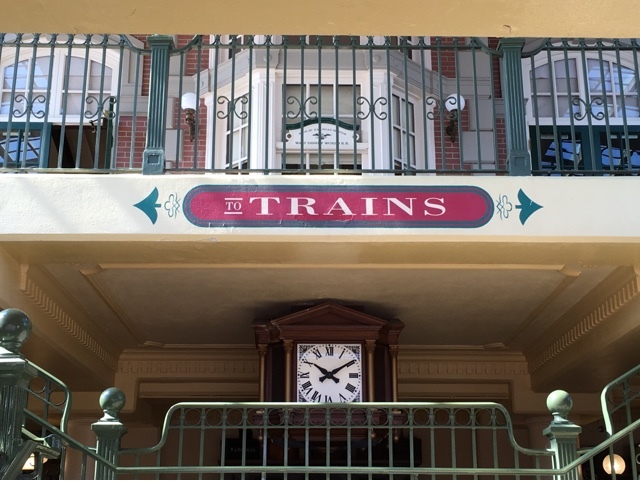 With its old fashioned clock, realistic ticket booth, and vintage waiting area, it really makes guests feel like they have stepped back into the early 1900s. I took this shot last week, just after getting my haircut at the Harmony Barber Shop. 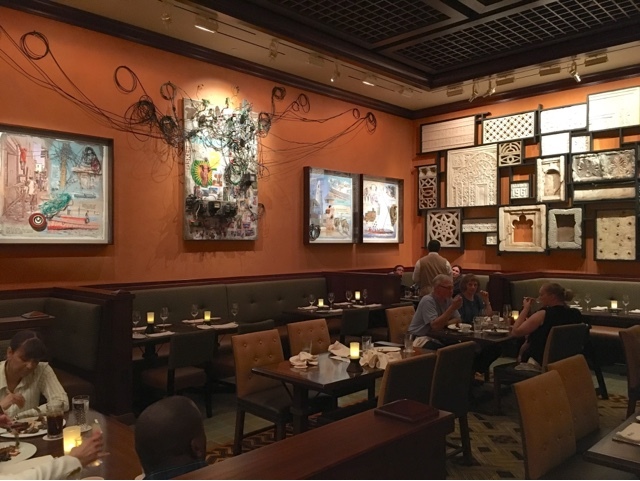 We had the opportunity to enjoy dinner at the new Tiffins restaurant at Animal Kingdom last week, prior to the actual opening. 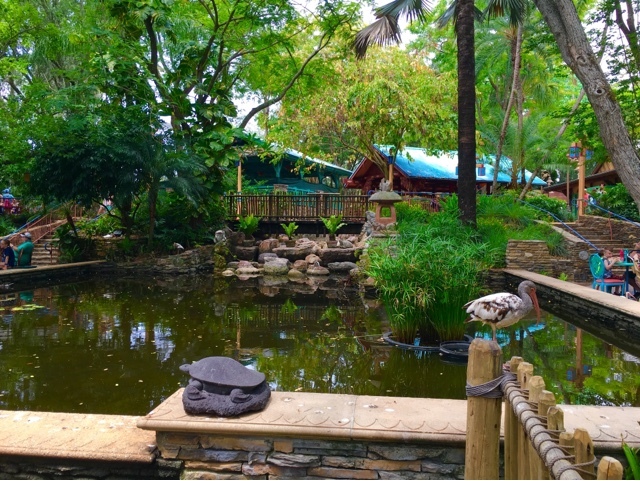 This unique spot has three distinct dining rooms, themed to different areas of the world. 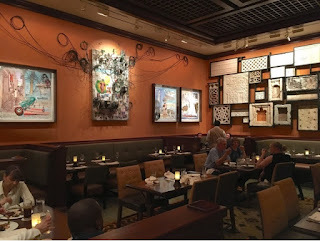 We ate in the "Safari Gallery," which is based on Africa. The art and photos all appear to be from that continent. 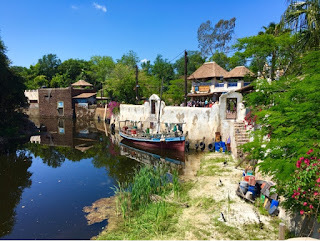 However, Animal Kingdom fans will quickly realize that the photos were actually taken in the Africa section of the park. Downtown Disney just completed its last major addition in its transition into Disney Springs. The "Town Center" area opened last week, with more new stores and restaurants, along with the actual "springs." There are still more retail and food spots to come, but the overall layout is now open. I took this shot yesterday from near the new Morimoto Asia restaurant. I love when I happen to catch unique sightings at Walt Disney World. One of these occurred yesterday morning, just before I got my hair cut at Magic Kingdom. 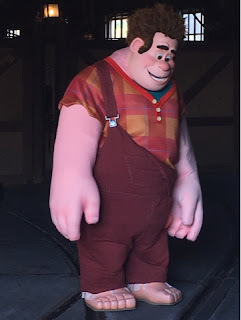 I caught this glimpse of Wreck It Ralph in the car barn in Town Square. He was having a private meet with a child who was part of the Make-A-Wish program. Since he could be seen by the public, many guests started "lining up" in hopes of meeting Ralph, but he was only there for one special little boy. 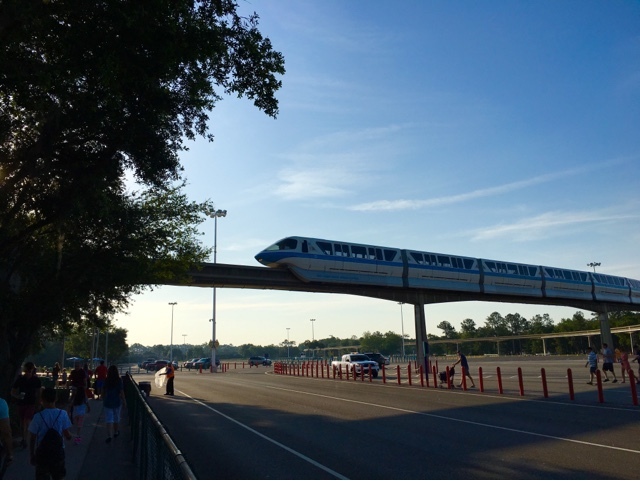 I spotted this scene developing while waiting at the Magic Kingdom monorail station this morning. I could see the boat leaving the dock and making its way toward the Grand Floridian. I snapped the shot precisely when the boat was in full view between the trees. 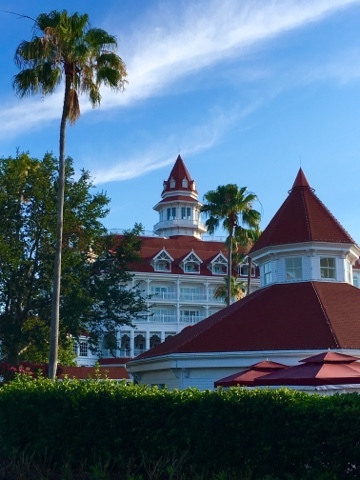 The Grand Floridian is majestic from just about any angle. I took this shot while walking on the path between the villas and the main lobby building. It was early in the morning, and the sun was in a good spot for this photo. 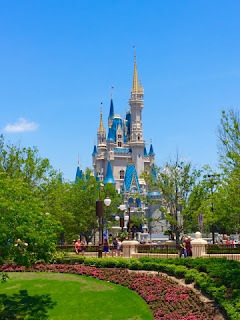 I have taken so many pics of Cinderella Castle over the years. However, I couldn't resist taking this one a few weeks ago. I snapped this shot from in front of Crystal Palace, while waiting for my guests to finish lunch on a picture perfect day. Pangani Forest Trail is one of my favorite spots in Animal Kingdom, mostly because of the gorillas. 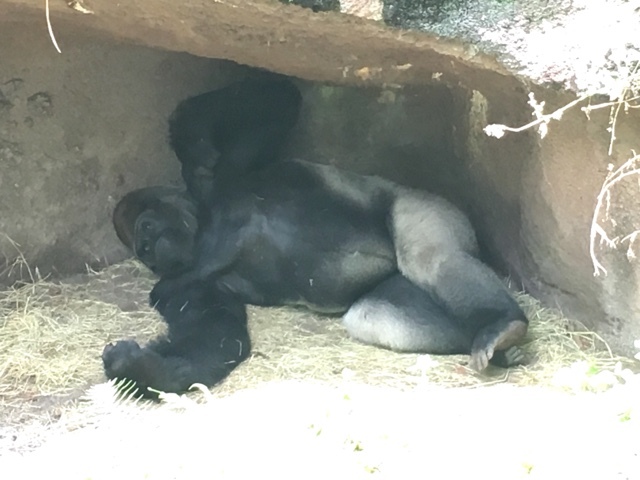 This guy likes to relax in a shady spot on the backside of the trail, near the exit of Kilimanjaro Safaris. Most guests don't see him, because you have to walk up to a fence and look down. I took this shot last week while my tour guests were enjoying the safari. Columbia Harbour House is one of my favorite places to eat at the Magic Kingdom. The food is good and the nautical theming is excellent. Also, there are some fun views to be had of Liberty Square and Fantasyland. I took this shot near the ordering counters last week. There has been a lot of excitement surrounding the new Star Wars Land coming to Hollywood Studios. 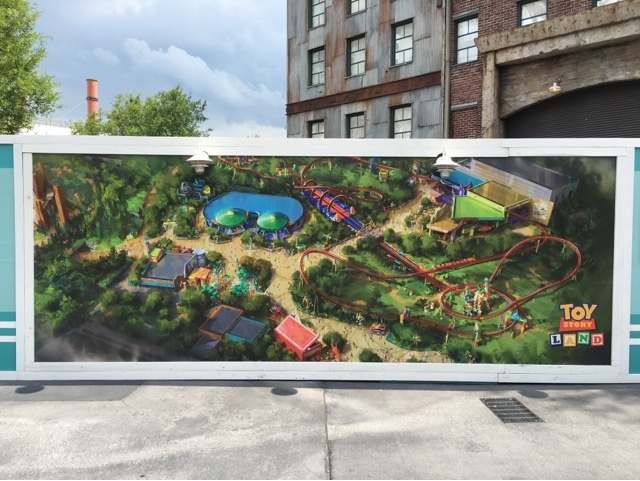 However, there is another large area that will be constructed simultaneously that is based on Toy Story Land. This large mural shows an artist's rendering of the new section. 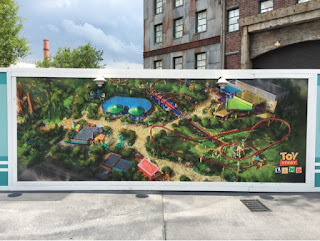 It is located on a construction wall in front of the entrance to the old Backlot Tour. Whenever I'm at Animal Kingdom, I always try to visit Pangani Forest Trail. 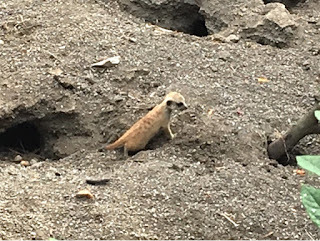 Some of the most interesting animals can be found there, including hippos, gorillas, zebras, and meerkats. 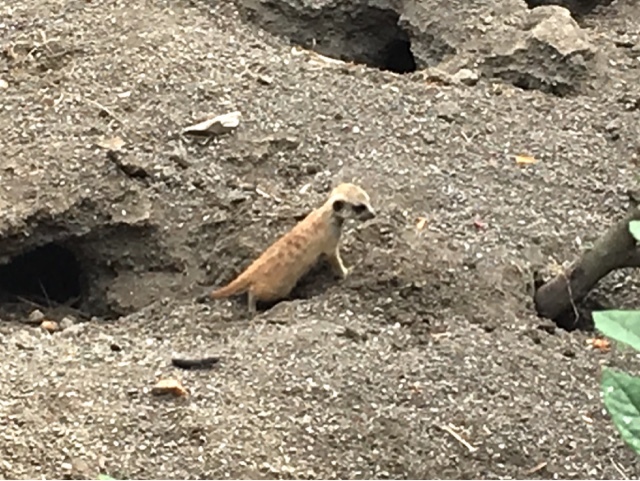 I took this shot of a baby meerkat on Tuesday, while giving a tour at that park. Flame Tree Barbecue is my favorite quick service restaurant in Animal Kingdom. It has great views and a delicious pork sandwich. This "pool" is at the center of the outdoor seating area. The turtle in the photo is stone, but the bird on the post is real. I was standing in Storybook Circus when I took this shot a few days ago. This circus cart is another great example of hidden details that most guests don't realize are there. The number 82 is a reference to the year that Epcot opened. 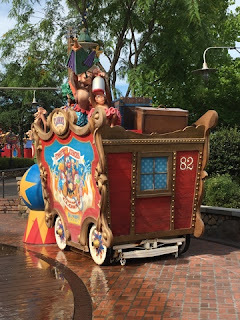 The remaining carts have 71, 89, and 98, for the opening years of the other three parks. 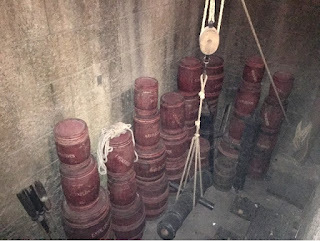 Today, I was walking thru Star Wars Launch Bay at Hollywood Studios when I came upon this interesting scene. 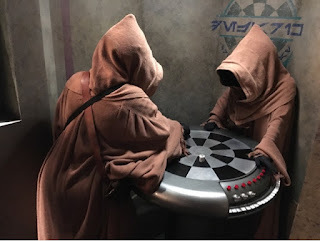 There were a couple Jawas enjoying a game of Dejarik. This pavilion has been a nice addition to the park, keeping Star Wars fans engaged while waiting for the huge expansion coming in a few years. Pecos Bill's has always been one of my favorite lunch spots at the Magic Kingdom. I ate there today, but sat up in the "Jack Sparrow" room. This is an additional dining room, adjacent to Tortuga Tavern, that is open when it is busy. 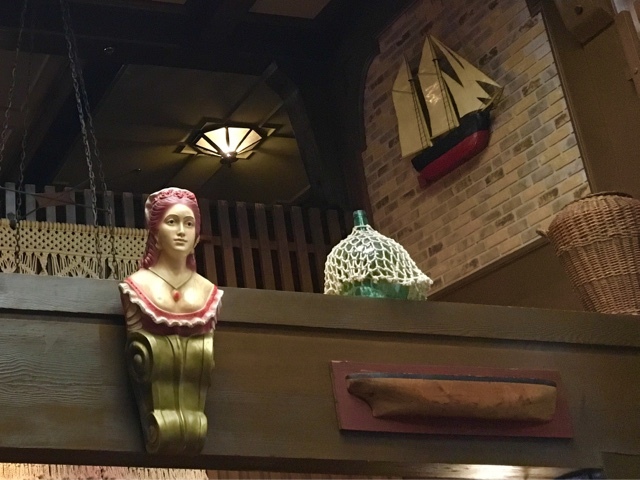 This shot shows the decor, which is more in line with pirates than with Frontierland cowboys. I took this shot a few days ago, shortly after arriving at the Magic Kingdom parking lot. These monorails are a very unique mode of transportation that can only be found at Walt Disney World. I like the lighting in the early morning for photos like this. Today, the temperature hit 90 degrees in Central Florida. However, it didn't stop Magic Kingdom guests from visiting Ye Olde Christmas Shoppe. There is holiday spirit all year at this spot. 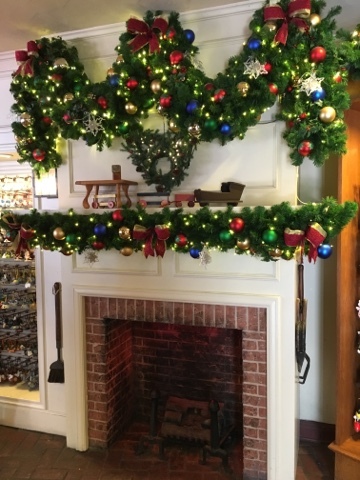 I took this shot of the fireplace (complete with garland hidden Mickey) while giving a tour. This is one of my favorite spots in Animal Kingdom, especially early in the morning. 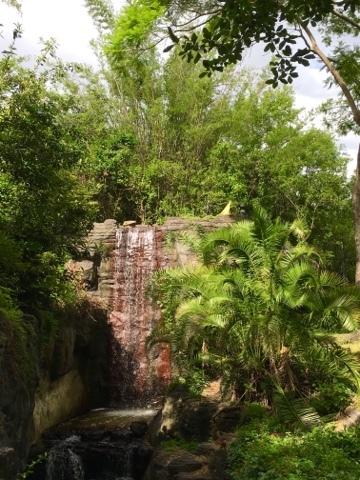 It is located near the exit of Kilimanjaro Safaris, but it is often overlooked by guests. This waterfall is actually on the backside of the Pangani Forest Trail, and large silver-back gorillas can often be found in the area. 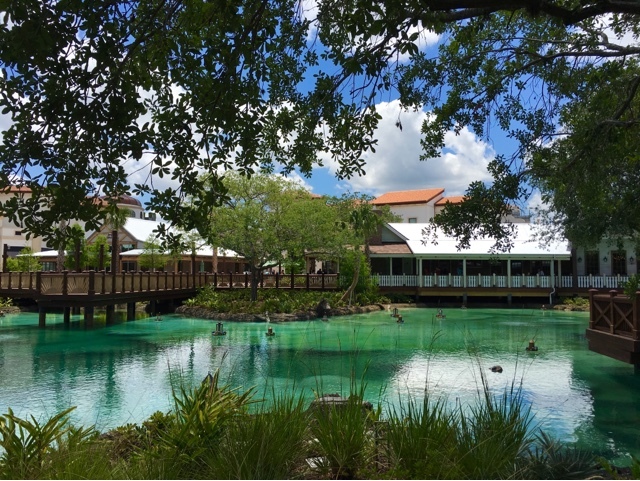 It is one of the most tranquil spots in the entire park. I took this shot a few weeks ago, while enjoying Wishes with my son at Magic Kingdom. We were standing near the entrance to "New Fantasyland" when I snapped the photo. This is one of my favorite areas to watch this show, as it gives you a great perspective without the large Main Street crowds. As I was walking through Animal Kingdom today, I noticed something that didn't look quite right. The "Concretosaurus" was a different color. 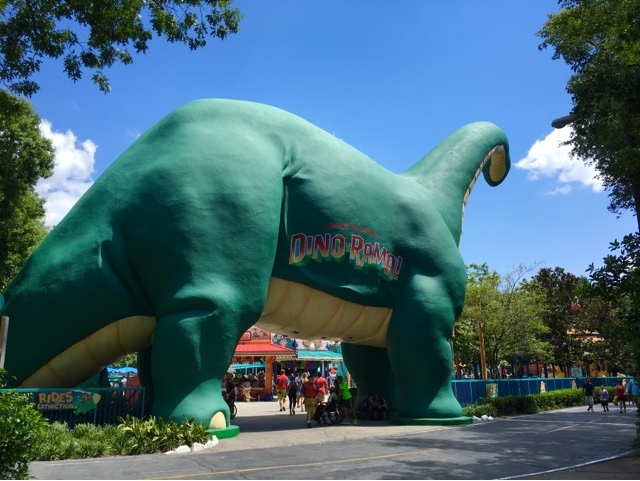 This previously yellow dinosaur is now green. I had posted a very similar photo back in February, but he had the lighter skin color back then. 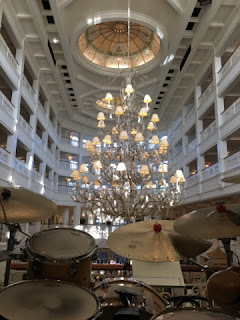 The Grand Floridian is home to one of the more spectacular lobbies you will find in a hotel. Many of my tour guests stay at that resort, so I have the pleasure of being there often. Today, I took this shot from behind the drum set of the "Society Band." Pirates of the Caribbean is one of the most classic of Disney attractions. It has one of the best queues, containing some fantastic details. This is a shot of the gun powder storage area, which can be found in the FastPass queue. I took this shot last week while enjoying the Magic Kingdom with my son. One of my favorite spots for photos is at Epcot in the morning. 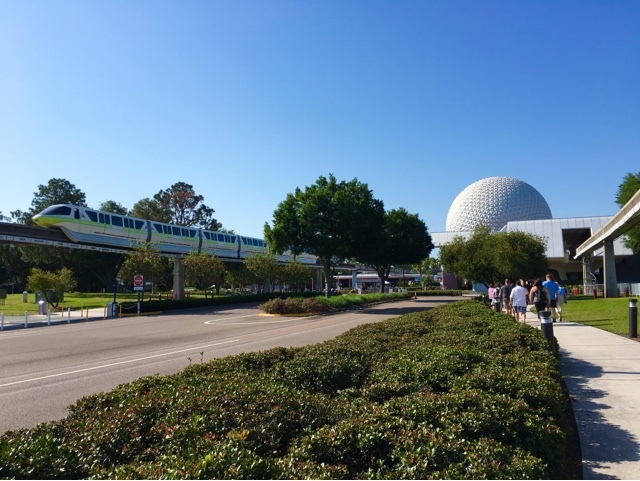 The conditions are normally clear, and the bright blue sky makes for a great background for Spaceship Earth. 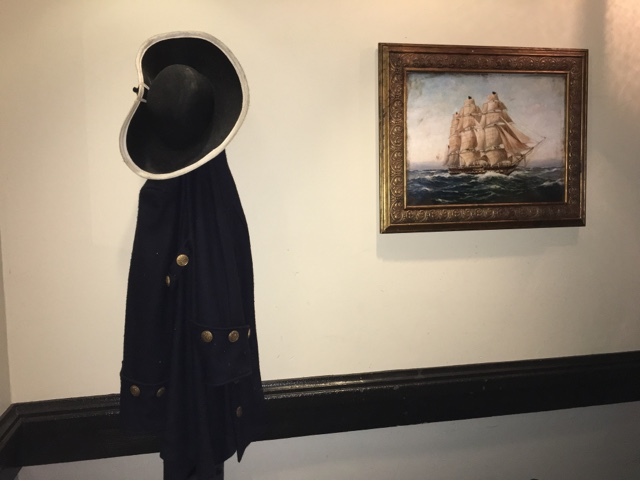 I took this shot while walking in at opening time a few weeks ago. 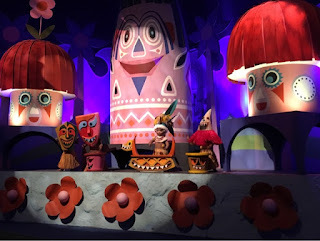 Here is another photo from our ride on small world last week. With over 250 dolls representing 100 nations, there are a lot of photo opportunities in this attraction. I took this shot as we were sailing through the Polynesian area. The Jedi Training Academy at Hollywood Studios has gone through some changes over the last several years. However, the presence of Darth Vader has remained a constant. 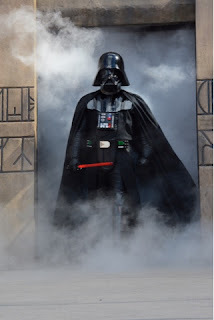 I took this shot a few weeks ago, just prior to several of my young tour guests taking the stage to face the dark side. Splash Mountain has some great photo opportunities, but it can be difficult to take them without getting your phone or camera wet. However, a few days ago, I was able to pull mine out during a few of the "non-splash" times. The Zip-A-Dee-Lady is right near the end of the ride. 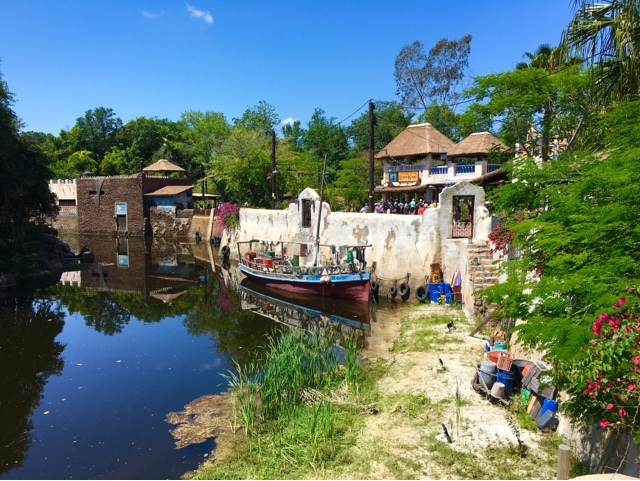 I gave a tour of Animal Kingdom last week, and had the opportunity to take quite a few photos. This is the relatively new area of Africa, near the Festival of the Lion King show. There are many details to be found in this shot, including an authentic boat docked on an overgrown beach. Last night, we caught much of Wishes from Fantasyland. 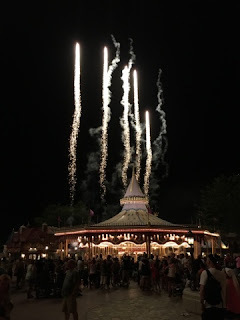 At one point, I was standing in the entrance to "New Fantasyland" when these fireworks were going off. 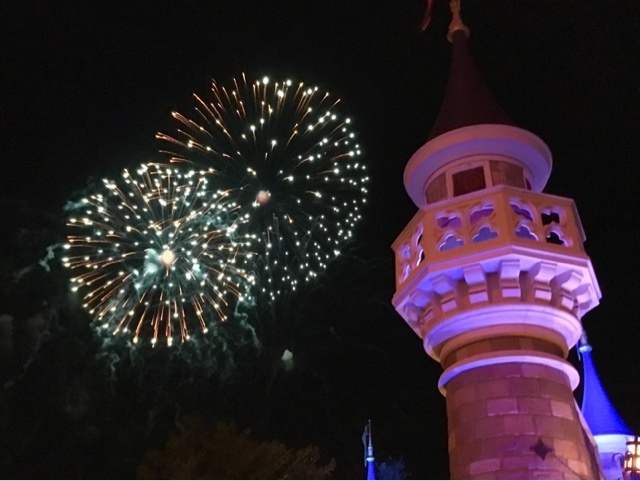 At this angle, it almost looked like they were being shot directly from the roof of Prince Charming Regal Carrousel. The most popular theme park attraction in the world just received a fun update. If you are wearing a "magic band," you get a personalized goodbye message while riding it's a small world. 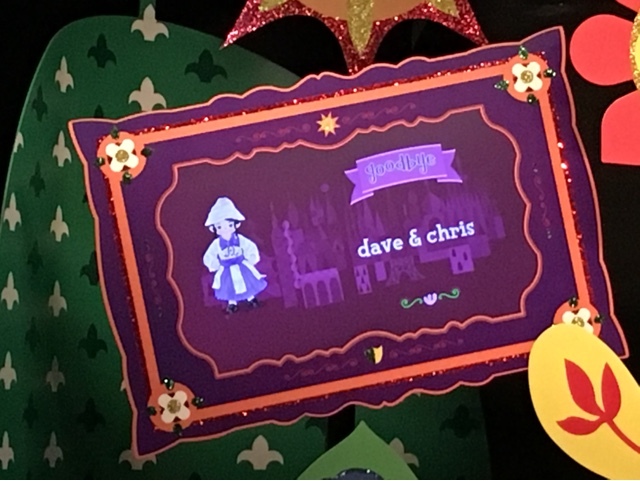 While enjoying this ride with my son tonight, we saw our names appear on a screen in the "goodbye" room. 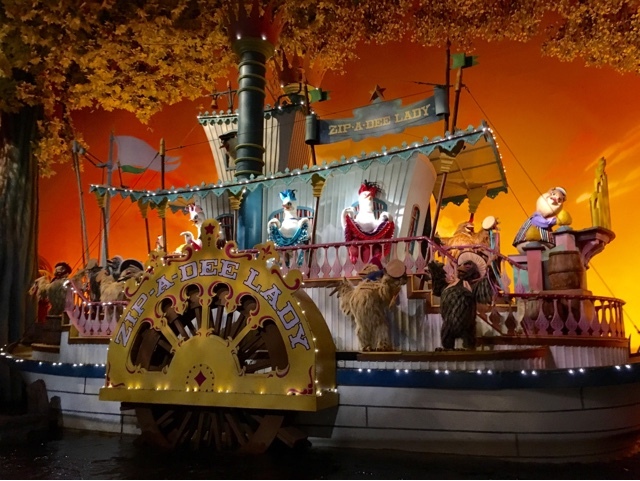 This is another example of Disney making good use of new technology to enhance the guest experience.